With network printing as a standard, the Ricoh Aficio MPC2551 is a workgroup-friendly multifunction device that can help increase productivity in a small to medium-sized office. The Ricoh Aficio MPC2551 multifunction printer offers innovative and timesaving features, including the duplexer and automatic document feeder, while the option to increase the paper capacity makes it suitable for bulk printing. However, fax is only optional and the high initial cost could be overwhelming for a small, start-up company. The Ricoh Aficio MPC2551 colour MFP printer resembles its predecessors with the floor-standing build, ADF, and the large and user-friendly display screen. The Ricoh Aficio MP C2551 digital colour printer offers fax as an optional feature. The understated frame measures 587 x 676 x 845mm, so it needs a dedicated space in the office. The Ricoh MPC2551 toner cartridges have a yield of 10,000 pages for black or 9,500 pages for the colour cartridges. 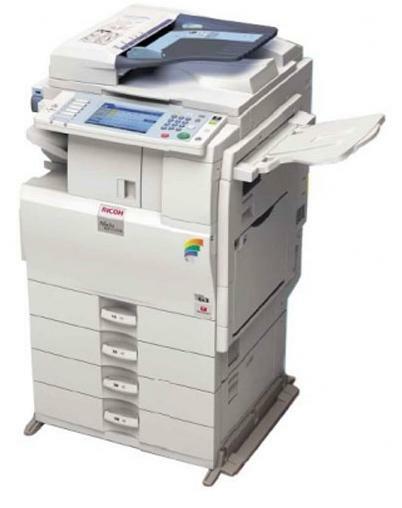 The eco-friendly Ricoh MPC2551 laser printer has low energy consumption and is integrated with a scanner and copier, with high and versatile paper capacity, and a standard duplex unit to help save paper and power. There is an intuitive internal punch unit and finisher in the Ricoh Aficio MPC2551. Documents and graphics can be printed at a maximum resolution of 1200dpi. The Ricoh Aficio MPC2551 can be shared via Ethernet or optional Wi-Fi. Direct printing from USB thumb drives and PictBridge-enabled digital cameras is also possible. Users can programme the device to be secure so their documents are protected from unauthorised access. The Ricoh MP C2551 A3 colour printer is expensive. The MPC2551 printer weighs approximately 100Kg, making it quite difficult to transport and move around. Wi-Fi and fax are only optional for the Aficio MPC2551 colour copier, while the highest scan resolution is only up to 600dpi, so some very detailed images may lose their quality.